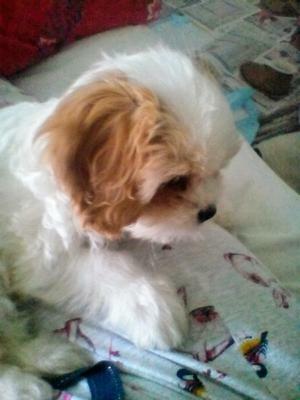 I have a 5-month-old Cavachon puppy. She is a lovely little dog but a terrible thief. I feed her well on the best food, she has good walks and a big garden to play in, but I can't let her off the lead when we are about because she won't come back. If another dog is with us she is fine and does exactly what she is told. Now she is growing and I have to put everything out of her reach. She will even drink my tea if I turn my back! I reprimand her and she thinks its a game. I have had a lot of dogs big and small but this one seems to be beyond me. Whew...Sounds like you have adopted quite a handful, however, many of the behaviors you are describing may be puppy related and will go away when she gets bigger. Some, though will need some work and will not improve with age. Understanding what is normal behavior of a puppy or teenage dog is the first step. Training to change these behaviors is the second. Puppyhood is a crazy time in the life of a dog and one can equate it to a human toddler- young preschooler. Just when you think they are moving beyond their puppy months, they arrive in adolescence, an even more challenging time for their owner. Sounds like you may be experiencing one of these stages, but it is never too early (or late) to start a training regime. Take the running away and not coming when called. There are some dogs that you just can't trust to be off of their leash. I would not think that a Cavachon would fall into that category. The Bichon side of her is likely coming out, playful and full of energy. Unless a dog has a solid recall, they probably should never be allowed off the leash. This means that training her to come when called is most important. This training should always be done in a controlled environment where she will not get hurt. Training her indoors to come when called is probably the best way to start. Stealing things, including sips of your tea is a puppy thing and many small dogs will try at least a few times to grab something that they view as valuable. I've seen tiny puppies as young as 6-weeks-old, go outside and grab a leaf off of the ground. They pounce back in as if they are the most clever creature on the face of the earth, and no one better steal that leaf. A couple of other basic dog commands might help when she tries to take something that she should have. Give: You teach her to give whatever she has in her mouth to you. You can use this command when she has something that doesn't belong to her. Leave it: You teach her to leave whatever she has that she shouldn't have before she picks it up and puts it into her mouth. You can use this when she tries to grab your tea. Puppy Proofing is another thing you might want to consider because puppies are going to grab whatever is within their reach. Putting up your possessions as well as anything that might be dangerous such as electric cords or chemicals will keep her safe. Anything she sees that she can put into her mouth or chew on, is fair game as far as she is concerned, whether it is your socks or your iPhone. Puppies need to learn manners just like human children to allow them to live peacefully with people. There are many excellent articles and videos on the Internet that will explain how to teach these basic commands. If this doesn't work, I would definitely recommend that you find a good puppy class and enroll her in basic obedience. You will be surprised at the changes you will see in your puppy. Join in and write your own page! It's easy to do. How? Simply click here to return to Small Dog Syndrome.